Would you like a scoop of ice cream for just $1? Oh yeah, I want one! Here you go! Thank you! 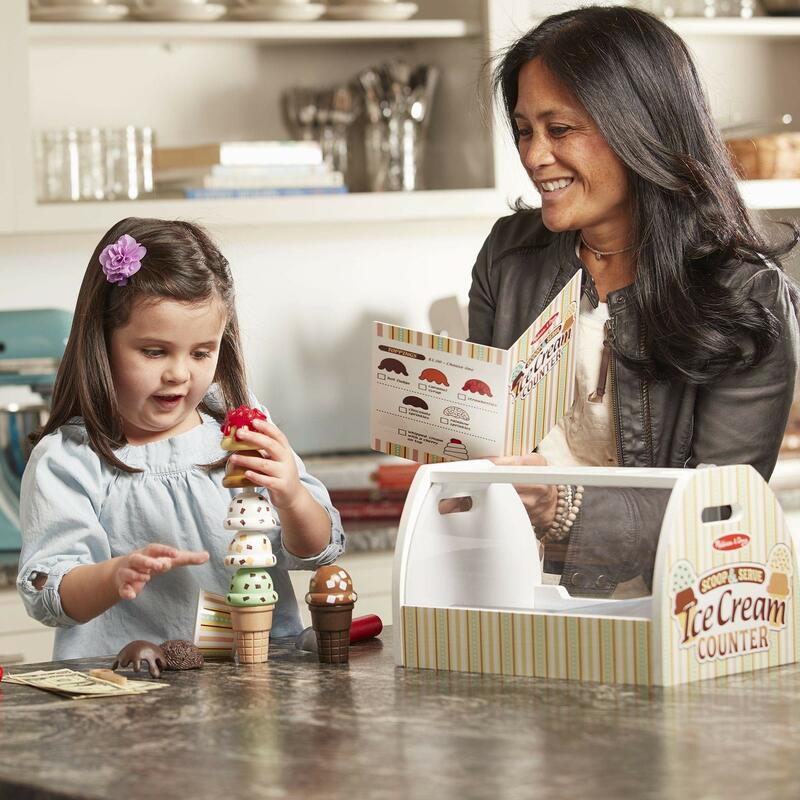 Here is your cash, keep the change!” If you want this kind of role play situation filled with so much fun and excitement with ice cream, buy the Wooden Scoop and Serve Ice Cream Counter from Melissa and Doug for your 3 to 6-year-old child. 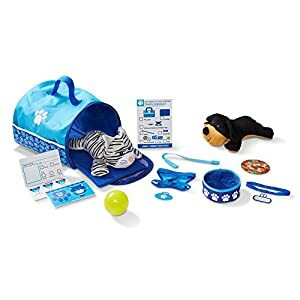 He or she is going to love it! 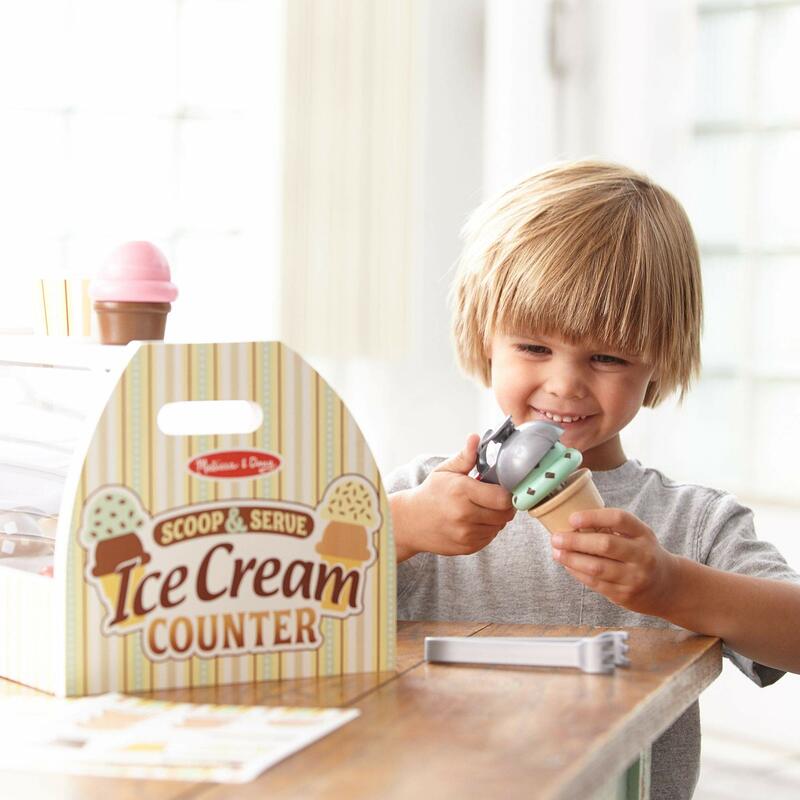 I know you are ready to make and sell scoops, but wait and see what this Melissa and Doug Wooden Scoop and Serve Ice Cream Counter has to offer. 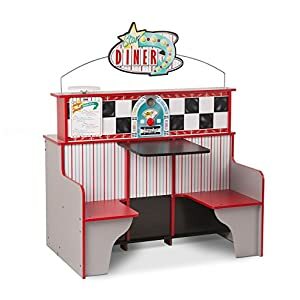 This product comes with up to 28-piece pretend play ice cream counter where you can easily place your ice cream cones. How do you like your ice cream served? With sprinkles of chocolate balls? With cream and vanilla? With a cherry on top? 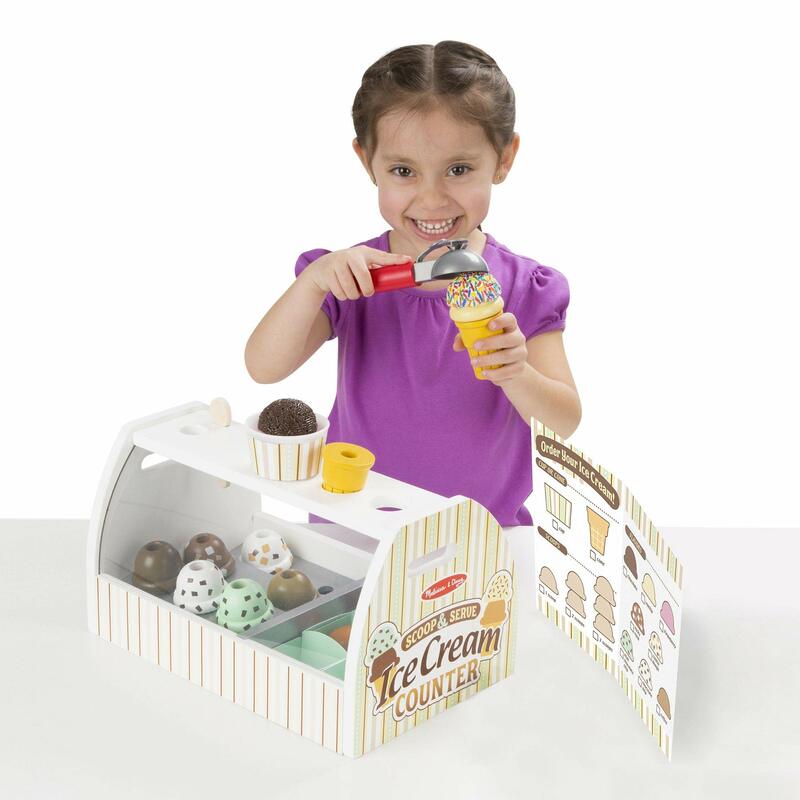 You will find on the table up to 8 different flavors of ice cream from which you can serve as the customer wants. 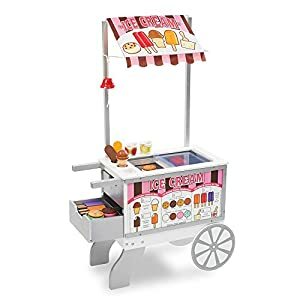 This counter also contains accessories that makes the job of an “ice cream vendor” easy; these include an ice cream scooper, tongs, a wooden spoon, six different flavored ice cream toppings, two ice cream cones, eight different flavors of wooden ice cream, etc. The Scooper was made in such a way that makes the stacking, scooping and releasing of ice cream very easy to do. Once the counter has been set, the next thing is to start business, there is a reusable menu card that you can place in front of each customers to place their order. 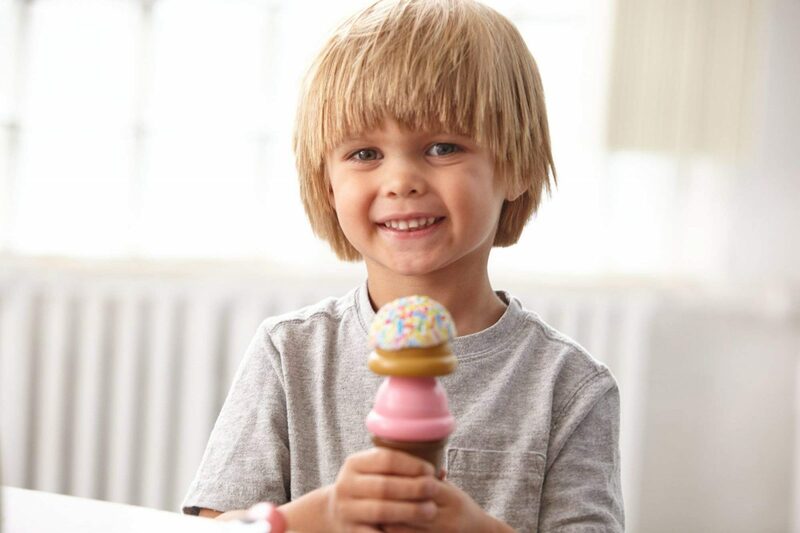 Once the order has been made and the ice cream is served, there are a couple of pretend dollar bills in the package that will make the role play perfect. 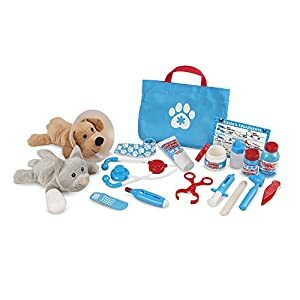 There have been complaints that the cones are too small, don’t worry, you can get more of Melissa and Doug’s things by clicking here. 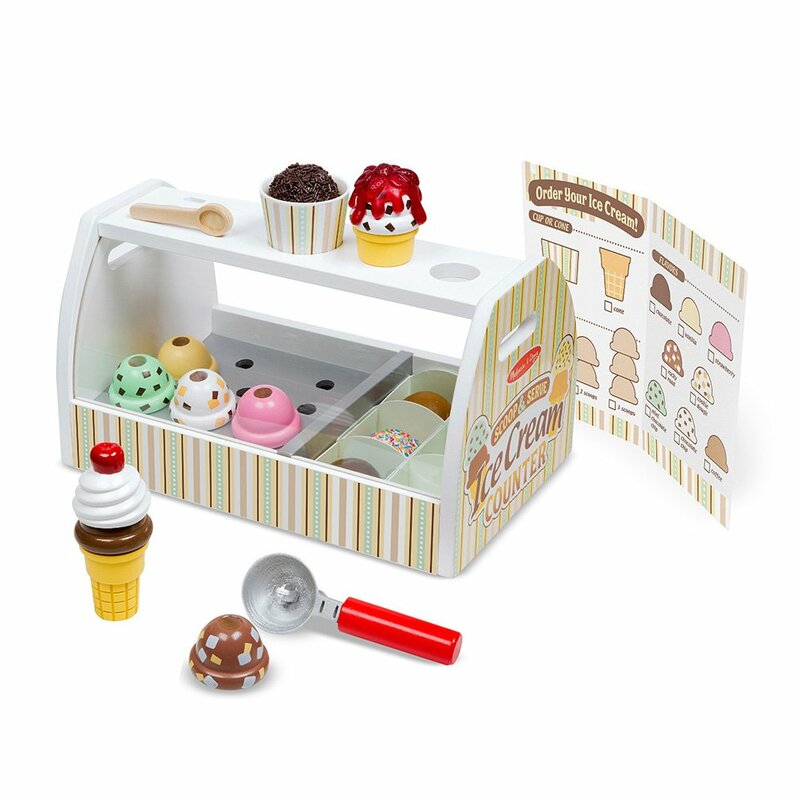 This Scoop and Serve Ice Cream Counter offers a great chance for you to teach your child on business dealings and the fact that you have to pay for services you receive from people. 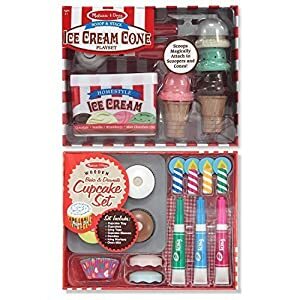 Accessories in this package are made with good quality materials, and they include the main counter, two cones, several forms of flavored wooden ice creams, tongs to hold things, and several other ice cream business items. 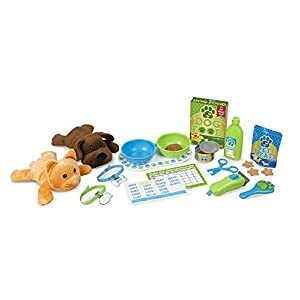 This entry was posted in Pretend Play and tagged melissa & doug ice cream counter, melissa and doug ice cream playset, melissa and doug ice cream toy, melissa and doug playset, scoop and serve ice cream set.